Gold Coast School's online practice exams take the stress out of preparing to pass your Florida real estate, insurance, or contrator exam. Focus your preparation on the key topics needed to successfully achieve your license. This collection of preparation exams will help you prepare for and ace your license exam! Our useful tools will fully prepare you for the difficult questions you can expect on the actual license exam. With our practice exams you can study at your own pace and focus in on areas that are especially difficult. 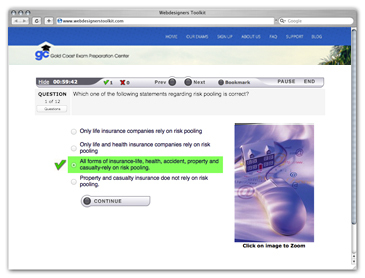 Each full exam package includes hundreds of questions built to simulate an actual license exam. We have designed your exam experience to give you full customization and feedback. Since 1970, Gold Coast Schools has helped thousands of licensees achieve their Florida real estate, insurance, contractors, mortgage, appraisal and CAM license. Our experienced instructors have developed these practice exams based on where we have found many students need extra training. Gold Coast Schools has been in the Florida Real Estate, Construction and Insurance training industry since 1970. We have literally trained more than a million students, and our experienced instructors have developed these exams with up-to-date exam question content. As instructors in licensing courses, we have developed a keen awareness of where people need extra help. Over the years we have prepared numerous exam questions, lesson plans, and other training materials. The online exam preparation tools offered here on goldcoastexams.com are simply the easiest, most up to date way to supplement and reinforce what you have learned in your licensing course.